Hadiyah-Nicole Green likens her story to that of The Little Engine That Could. The 34-year-old assistant professor is the first in her family to go to college, let alone earn a doctorate. She’s also broken ground at her alma mater as the second African-American woman to receive a Ph.D. in physics from the University of Alabama at Birmingham. And by now, you’ve probably heard that Green is the recipient of a $1.1 million grant to develop a cancer treatment. This woman is on fire. But despite her many accolades and recent celebrity—well, at least among black Americans—what stands out most is her humility and determination. She radiates a positive aura, even when discussing past adversity. Over the phone, she beams. “The lessons learned, the heartaches, the struggles. I know that I wouldn’t be where I’m at now if I hadn’t gone through those things,” says Green. No matter the difficulty, she counts her past experiences as blessings. “The process has been way too spiritual to make it purely academic,” she says. Green spent seven years completing her master’s and doctorate at UAB, developing a way to target cancer cells. As a graduate student, she recalls seeing—and greeting—other black women in her department. Often they in were in support roles: secretaries, janitorial staff and lab technicians. To say that graduate school for Green had its challenges would be an understatement. “The struggles were real,” says Green when recalling her path toward a doctorate. Green remembers calling home in tears. But her family—biological and church—were strengthening. Her uncle, General Lee Smith, who, along with her aunt, Ora Lee, raised Green after the passing of her parents, often gave her pep talks. “This ain’t nothing for a sucker like you,” he said. The physicist’s “village” constantly affirmed her. The St. Louis native says that back home, they called it “souping your head up,” or aggrandizing. Green’s people gave her props, and she would practically brainwash herself into believing that she could achieve even her wildest dream. This support, coupled with spirituality and a picture of President Barack Obama hung across from her bed, kept Green motivated: “If [Obama] gets elected as president of the United States, I can get a Ph.D. in physics,” she said. But, of course, there were roadblocks. Haters gonna hate. Among the doubtful was a particular dissertation-committee member. Green recalls him laughing at her, saying that she would never graduate. Green avowed, “I don’t have anything else in [my professional] life that I want to go do.” Being a physicist was her passion, and the 34-year-old resolved to succeed. The man finally agreed to give Green his approval if the committee unanimously passed it. 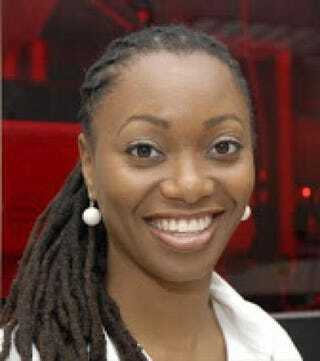 The world then welcomed Dr. Hadiyah-Nicole Green. Green received a doctorate in physics in 2012—a year when, according to the National Science Foundation, only 686 black women (pdf) were awarded Ph.D.s in science, technology, engineering and mathematics fields, and fewer than 100 of those degrees were specifically in science. In the same year, her white counterparts (women and men) received 6,777 and 8,478 degrees (pdf), respectively. “When I finished my Ph.D., I did not want to go back into the lab,” says Green. She took time to sort through her options. With 12 job offers, she took a short-term position in Singapore. When she returned to the states, Green decided to take an assistant professorship at Tuskegee University, with her uncle’s blessing. Months after she assumed the post, Green’s uncle, a two-time cancer survivor, passed away. Her aunt also battled cancer, and the physicist didn’t want others to go through what she and her uncle had to endure. She focused her professional efforts on cancer research. But winning a $1.1 million grant through the Veterans Affairs Historically Black Colleges and Universities Research Scientist Training Program was no walk in the park. “I never watch the clock when I work,” says Green. This includes whether she’s in the lab or grant writing. “I set my goals, my tasks and my to-do list, and I just work.” Green considers research a marathon, slow and methodical, not a sprint, and this principle follows with grant writing. On her third attempt, Green received notice of intent regarding her grant in November. This means that though the $1.1 million check has yet to be cut, it’s on the way. The work in cancer research is more important than notoriety. “I’m just a vessel for God to use; it’s not really about me,” she espouses.